- all skippers who have been day sailing in coastal waters and want to adventure in longer passages, by day and by night and in tidal waters. - all those that aim at taking the Yachtmaster Coastal/Offshore practical exam. The course takes place over two weekends, with sufficient time in between to study. The focus of the course is on the planning of long passages, including pilotage in and out of harbours. We will refresh all the basic elements of navigation (lights, buoyage, COLREGS, course to steer, etc). Then we will spend quite some time on tides and tidal streams, secondary ports, passage planning, pilotage and weather. Finally we will carry out a number of exercises using the training charts and almanac included in the training pack. You can book directly online by first choosing your preferred dates below and then clicking the 'Add to cart' button. Or you can also give us a call or send us an email with your desired dates. We will then get back to you with a confirmation. 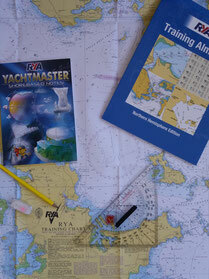 Once you book the course, we will send you the course pack (containing the RYA Handbook, RYA training charts and almanac, Breton plotter, dividers) so you can start browsing through. We will also send you the detailed joining instructions. Please choose your course dates here below! - Characteristics of lights, using lights as navigational aids.